The new body size features a 'wider bottom'. Bootylicious. NAMM 2013: Taylor is launching a new body shape at Anaheim this year, the Grand Orchestra, which becomes the fifth body shape in the company's acoustic guitar ranges. The new shape will be used for three new strictly limited First edition models, the 518e, 618e and 918e. For more information, visit the official Taylor website. Taylor Guitars is unveiling the next body shape in the evolution of the company´s guitars: the Grand Orchestra. The new model, which makes its official debut at the NAMM Show, boasts Taylor´s boldest, richest voice, one that manages to blend low-end power with surprising balance and responsiveness for a big guitar. Players are sure to be impressed by the Grand Orchestra´s versatility: Aggressive strummers will love the robust output, while fingerstyle players will enjoy the dynamic range and sensitive response. Last year, the company was inspired by a desire to revoice the Taylor Jumbo, but Taylor´s design group instead opted to start from scratch and rethink the possibilities of a modern big-bodied guitar. Taylor master luthier Andy Powers began the design process by experimenting with body dimensions. He wanted to capture some of a Dreadnought´s robust tonal personality to produce big, round, richly solid notes. Slightly longer than a traditional Dreadnought, the Grand Orchestra features a tighter waist and a wider bottom bout to heighten the tonal properties. The body depth was also expanded to increase the air volume. “Bob Taylor has compared it to the lungs that support someone´s voice,” Powers explains. “By creating a bigger ‘lung,´ you have the bigger, fuller, more powerful capacity to support lower frequencies.” To maintain balance across the entire tonal spectrum, Powers designed a new bracing scheme. A hybrid of scalloped and parabolic bracing, the design causes the top and back to pump like a speaker cone, making the guitar loud and uniformly responsive from lows to highs. What emerged from the new shape was a strong, complex voice with the kind of tonal balance that fits perfectly into Taylor´s family of shapes and sounds. 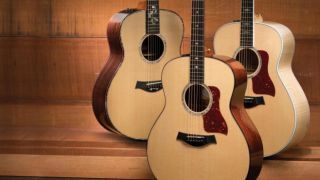 To celebrate the new shape, Taylor is initially releasing the GO in three ultra-limited batches of First Edition models: the 518e, 618e and 918e. Each will feature premium grades of wood, along with other upgrades. The 518e features a back and sides of solid mahogany, a solid Sitka spruce top and bracing, and is accented by the “Deco Diamonds” inlay; the 618e boasts a back and sides of solid, AA-grade Big Leaf maple, a solid Sitka spruce top, Adirondack bracing, and the “Twisted Oval” inlay scheme; and the 918e incorporates solid AA-grade Indian rosewood back and sides, a solid Sitka spruce top, Adirondack bracing, and the popular “Cindy” inlay design. All First Edition GO models will be released without a cutaway to accentuate the body shape. The Grand Orchestra is the fifth body shape in Taylor´s acoustic guitar line, joining other proprietary Taylor shapes including the Grand Concert, Grand Auditorium and Grand Symphony, along with the Dreadnought. Grand Orchestra models will be designated within the Taylor series ending with the numeral “8” (e.g., 618e). GO models will be available at Authorized Taylor Dealers in the United States.